We need to see doodling for the remarkable tool it is and learn to use it to its full advantage. Doodling allows us to access parts of our minds that are not available otherwise, and that leads to insight. There is research that shows that children who are presented with visual information have a better understanding of the subject matter. Furthermore, these kids showed more of an understanding when they actually create their own visualizations of what they learned. We are all better at connecting the dots when they literally take a pencil and connect dots, or doodle whatever comes to mind when thinking about a topic. Drawing with pencil, pen, or brush on paper isn’t just for artists. For anyone who actively exercises the brain, doodling and drawing are ideal for making ideas tangible. 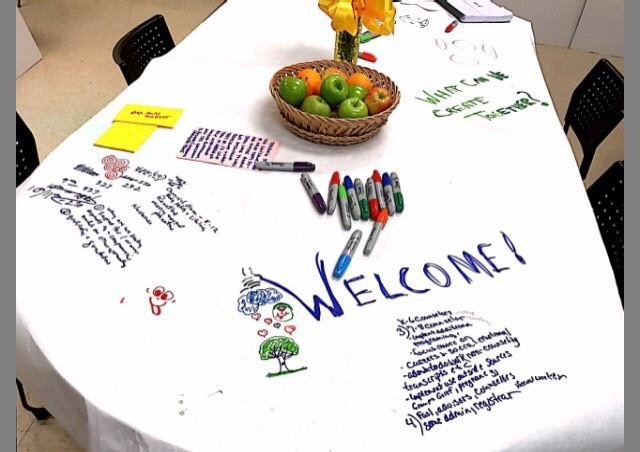 In order to encourage doodling in meetings, retreats, and professional development events I put white butcher paper sheets on the tables, a box of crayons, and a small container of colored markers to use for doodling. Then there other details, like getting small flower vases and the flowers. These may seem like little things, but you have to understand that creating the perfect environment is crucial to convening great conversations. Recall a time when you had a great conversation where real learning or new insight occurred—what enabled that to happen? In this way, participants have the opportunity to participate in an environment where the emotional context and framework support innovative thinking. If you can design the physical space, the social space, and the information space together to enhance collaborative learning, then that whole system turns into a learning system. As a side note, many of our presidents, like the rest of us, doodle. Dwight Eisenhower drew images of tables, pencils, and nuclear weapons. A Herbert Hoover doodle provided the pattern for a line of rompers. Ronald Reagan dispensed cheery cartoons to aides. John F. Kennedy reportedly doodled the word poverty at the last cabinet meeting before his assassanation. Are you encouraging your team to doodle? « Blooming Leadership: Got Flowers?